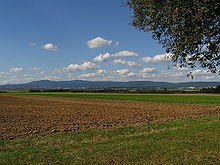 The Taunus is a mountain range in Hesse, Germany. It is bounded by the river valleys of Rhine, Main and Lahn. On the opposite side of the Rhine, the mountains are continued by the Hunsrück. The mountains themselves span the districts of Hochtaunuskreis, Main-Taunus, Rheingau-Taunus, and Rhein-Lahn. Not to be confused with the more famous and high Feldberg in Black Forest, the highest peak is the Großer Feldberg (878 m above sea level). It is followed by the Kleiner Feldberg and the Altkönig (798 m) with the remains of a late Iron Age hill fort (La-Tène A, ca. 400 BC) near the summit. The Roman Limes was built across the Taunus. The Saalburg, a restored Roman castellum, now houses a museum. After the fall of the Limes (in 259/260 AD), the Alamanni settled here. Wikimedia Commons has media related to Taunus.